"1997. New York City is now a maximum security prison. Breaking out is impossible. Breaking in is insane." Whoever came up with the tagline for John Carpenter's Escape from New York truly earned their salary, for it made the film itself sound irresistible to its potential audience back in 1981, part of that golden age of the late seventies, early eighties when a combination of fresh talent arriving off the back of New Hollywood and advances in special effects contributed to a burst of creativity in the horror, science fiction and fantasy genres. This was one of the science fiction hits, another for Carpenter after the massive success of his slasher classic Halloween. Like that horror favourite, it spawned many imitators since the director made what he did look easy, and the slew of efforts that were not up to his standards proved this was not the case, though Escape from New York happened to show up when a certain Australian hit that was not a million miles away in overall effect was as big an influence. That film was George Miller's sequel Mad Max 2, known as The Road Warrior in the United States, and combined a futuristic theme with action thrills much as this did. Between them both, they spawned a whole sub-genre that had lone wolf anti-heroes embarking on escapades that mixed the brave with the foolhardy. Carpenter claimed to have been inspired by a Harry Harrison novel (Harrison also inspired dystopian cult item Soylent Green) when he was coming up with his screenplay (working with regular cohort Nick Castle), and there was a sense that he was bringing the strengths of written sci-fi to the big screen to create the celluloid equivalent of a fast pulp read, the sort he had grown up enjoying. In Kurt Russell, he has his best leading man (they would work together three more times), playing Snake Plissken as a Clint Eastwood-in-Spaghetti-Western guise, laconic, self-interested, but with a certain sense of humour about him offset by an unanticipated morality. What Snake has to do is break into Manhattan Island, now walled off from the rest of a crime-ridden America, and rescue the President (Donald Pleasence) who has ejected from a hijacked Air Force One that had been diverted over New York by terrorists. The authorities, led by Lee Van Cleef (again with the Westerns referencing), take supercriminal Snake out of his sentence and order him to rescue the Leader of the Free World so he can attend a vital conference with the Soviet Union and China to avert global disaster in a Third World War. To add urgency, Snake has two small explosives implanted in his neck that will kill him should he not get back with the Pres in time. Like many of Carpenter's best-loved movies, it was a great premise, though while there were increasing amounts of action as the plot drew to its finale, that attention to mood and atmosphere were what marked him out from his competition. Supporting Russell was one of the best ensemble casts of the era, from Harry Dean Stanton as the wily Brain, Adrienne Barbeau as his partner and fixer, Isaac Hayes as the Duke who rules the damned of New York like a feudal lord, to Ernest Borgnine as the friendly and useful Cabbie (you get the impression this nice guy was walled in accidentally). But that bleak, exciting tone was what made so many craft their own variations. Especially in Italy, where Escape from New York and Mad Max 2 were runaway successes, therefore with that nation's magpie approach to exploitation filmmaking copies and rip-offs were made. From 2019: After the Fall of New York to 1990: The Bronx Warriors to 2020: Texas Gladiators (evidently pointing out the date in the title was important) they were popping up throughout the early-to-mid-eighties, picking and choosing whatever bits and pieces they wanted to lift from Carpenter and Miller, often moving from one basic plot to the other within the space of a single movie. Joe D'Amato would make that last one, and he would also make Endgame in 1983. It was also known as Endgame: Bronx lotta finale, just to get the New York City reference in there so the target audience knew what they were in for, and was a loose third instalment to the series started with 1990: The Bronx Warriors and followed up with Escape from The Bronx, Enzo G. Castellari's attempt to take off Carpenter and including possibly more explosions than any other film known to humanity. In Endgame, we started off in the regulation urban ruined hellhole with Al Cliver as the participant in a futuristic, televised gameshow, sort of The Crystal Maze if you were allowed to murder your fellow contestant in it, which has made some see it echoed elsewhere. Yes, The Running Man in 1987 could be regarded as an Escape from New York knock-off from some angles, except that starred Arnold Schwarzenegger not Kurt Russell, and had been based loosely on a Stephen King novel when he was under his Richard Bachman pseudonym, published in 1982 before you accused the great author of taking his plots from notorious schlockmeister D'Amato. In Endgame, Cliver was pitted against military man Gordon Mitchell, fellow competitor George Eastman, and teamed up with psychic Laura Gemser as the script added Beneath the Planet of the Apes into the mix. The results were ordinary compared to Carpenter, serving to flatter him. Oddly, when Carpenter returned to the well in 1996 with Russell in Escape from L.A., it was as if someone was trying to pay tribute to him with a second-rate imitation, except that someone was Carpenter himself. 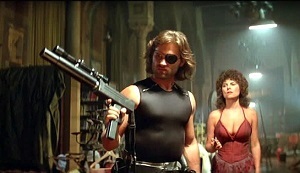 The plot had Plissken dispatched to Los Angeles after a major earthquake has separated it from the rest of the United States to rescue the President's daughter this time, and prevent the end of the world to boot, but largely appeared to be an excuse for Carpenter to crowbar in as many guest stars as he could, from Peter Fonda to Bruce Campbell to Pam Grier, all upping the cult appeal but failing to find anything but the cheesiest of scenes for them to play. Even more oddly, it took a Brit to make the best homage to Escape from New York, combined with Mad Max 2 and a smattering of other cult titles, in 2008. That writer-director was Neil Marshall, and the film was Doomsday, so in love with its influences that it never really became its own entity, but when the tribute was this full-blooded battle cry, who cared about such delicacy? In place of Snake was Eden Sinclair (Rhona Mitra), another eyepatch-sporting badass (though she ditches the patch pretty swiftly) and avoiding the traps all those Italian followers hit by making the lead a woman, thereby fooling the audience we were seeing something fresh, unless you had seen Aliens in 1986. Or indeed the gathering filmography of Milla Jovovich. But Marshall was so keen to evoke Carpenter and one of his favourite films of his youth that he aped the plot of Escape from New York, applying it to Britain by having everywhere north of Newcastle quarantined and left to its own devices after a deadly, super-contagious disease outbreak in Glasgow threatens to run rampant through the population. Then we jump a couple of decades to see Eden, having escaped Scotland as a little girl to grow up into an expert soldier, on a mission back north to find a cure that may or may not be there, imperative now the virus has broken out again in London. With Carpenter-esque graphics, even the same font used for the credits and captions, and characters named familiarly, you could argue Marshall was too slavish in paying his respects, but amid answering questions that his hero didn't ask, such as where the inmates got their food from (here they're cannibals), he got one thing exactly right: if you're going to make a cult movie, make it something the audience wants to return to. Escape from New York was one of the most rewatched movies of the eighties, especially when it hit home video, never mind its regular showings on television as a guaranteed audience-attractor, and Doomsday had that touch to it. Obviously, you're never going to eclipse an original being this faithful, but they complemented one another nicely in a way the Italian efforts of the eighties did not quite match, though the high octane action, car chases across rough terrain (or a debris-strewn bridge for Carpenter), diversions like entertainment for the trapped or the lack of sentimentality when it came to dealing with the characters' fates, since this was a hard-edged concept, all were shared by the 1981 and 2008 works. As time has proven, a lot more people remember Escape from New York (and Mad Max 2) than remember Doomsday, but that was a mark of an innovative idea married to a strong atmosphere and a fully imagined world as all science fiction truly needs to succeed. Though there remain those who feel Carpenter could have gone further, for the diehard fans this was top entertainment as it was. [Escape from New York hits cinemas and shops in a new 4k restoration from Studio Canal. As before, I've no idea if it's any good because they sent me the DVD. But here are the extras you'll get if you buy the box set. Purgatory: Entering John Carpenter's ESCAPE FROM NEW YORK: A brand new retrospective documentary produced by Ballyhoo Motion Pictures and featuring interviews with writer Nick Castle, cinematographer Dean Cundey, composer Alan Howarth, production designer Joe Alves, special visual effects artist/model maker Gene Rizzardi, production assistant David De Coteau, photographer Kim Gottleib-Walker, Carpenter biographer John Muir, visual effects historian Justin Humphreys, and music historian Daniel Schweiger.